TORONTO, ON--(Marketwired - November 03, 2015) - What began as an idea to present fire safety and prevention to a class of adult ESL (English as a Second Language) learners in Guelph Ontario 15 years ago, is today an award-winning multi-level curriculum resource available to adult ESL instructors across Canada designed to save the lives of immigrants and their families while they learn to listen, speak, read and write in English. Initially, a few ESL instructors tried to source suitable teaching material on fire safety/prevention, part of the CIC-funded LINC (Language Instruction for Newcomers to Canada) curriculum and realized that information was sparse and not at an appropriate level for non-English speaking adults. When they approached the Guelph fire department for assistance, they learned that educating newcomers on fire safety/prevention was one of its priorities. Over the ensuing years, a curriculum on fire safety and prevention was developed cooperatively to cover all levels of adult ELS programs. Funding from the Ontario Ministry of Citizenship and Immigration and International Trade in 2013 enabled them to create an online version of the resource. 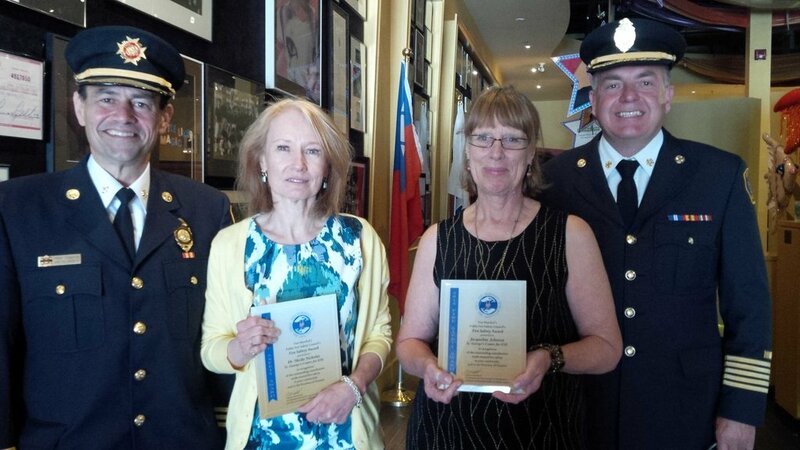 Fast-forward to 2015 when Jacqueline Johnson and Sheila Nicholas from St. George's Centre for ESL, Upper Grand District School Board, who were responsible for realizing the completed curriculum in cooperation with the Guelph Fire Department's Chief Fire Prevention Officer Tony Sabatini, were not only recognized by the Guelph Fire Department in February 2015, but also went on to win the Ontario Public Fire Safety Educators Award. "As adult ESL instructors, our job is not only teaching new immigrants the English language, but also helping them adapt to our culture, minimize risks and ensure their safety in case of fire," says Sheila Nicholas, Program Manager Adult ESL and LINC Programs. "The Award is exciting, although secondary to our dedication as ESL professionals in helping newcomers to Canada survive and become successful citizens," she adds. The key topic areas taught are: Creating a fire escape plan; Escaping from a fire; Putting out small fires; Everyday fire prevention; and include things most Canadians take for granted such as calling 911, cooking/BBQ safety and smoke/carbon monoxide alarms. The program is set up in three stages with 50+ multi-level lessons. The first stage involves a visit, tour and presentation at the local fire department; the second, a fire official discusses fire safety topics with learners; and the third stage is a post-course assignment given by the ESL instructor to evaluate both content and language for learners in the different learning levels. The Fire Prevention & Safety Curriculum can now be found on the national resource website, Tutela, for digital access by ESL instructors to be able to teach their adult students in a complete, correct and consistent fashion. In addition, all fire departments in Ontario have access to Chief Sabatini's verbatim presentations for their use. The program has also been promoted on the websites of various fire departments and fire safety organizations. On November 12, 2015, ESL instructors will have an opportunity to learn first-hand from presenters - Jacqueline Johnson, Sheila Nicholas and Tony Sabatini - how to download and use this award-winning ESL curriculum to plan and deliver language lessons on the topic of fire safety and prevention at TESL Ontario's annual conference November 12-13, 2015, in Toronto. The 43rd TESL Ontario conference #TESL2015 is a highlight of ESL Week taking place at the Sheraton Centre Toronto. It is perhaps the largest conference of its kind in Canada, hosting close to 800 delegates. Language training professionals from public and private sectors, academics, researchers and government representatives will choose from more than 100 informative sessions on a variety of teaching techniques that work, as well as learn about the latest research in the field, the newest software and publications on the market, and other resources that support English language educators. TESL Ontario, established in 1972, is a non-profit organization serving the needs of teachers of English as a Second Language. It represents more than 4,600 language training professionals working in immigrant serving agencies, school boards, publicly funded sites across Ontario, colleges/universities, elementary/secondary and private language training schools. TESL Ontario's expertise is in teaching, advocacy, accreditation and professional development. The organization is instrumental in influencing the success of many thousands of English language learners throughout the province. For more information visit www.teslontario.org and follow us on Facebook, LinkedIn, Twitter and Pinterest.